Bulova is best known for it’s Accutron series that introduced the world to the resonating tuning fork that quickly became its logo. 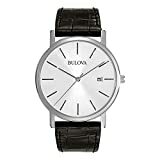 While recent watches have done away with the tuning fork logo, the impact of Bulova on the watch industry is still felt today. 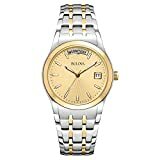 Gracious watch has featured the Best Bulova Watches to Own (For Men) as well as a recent review of the Bulova Precisionist 98B212. 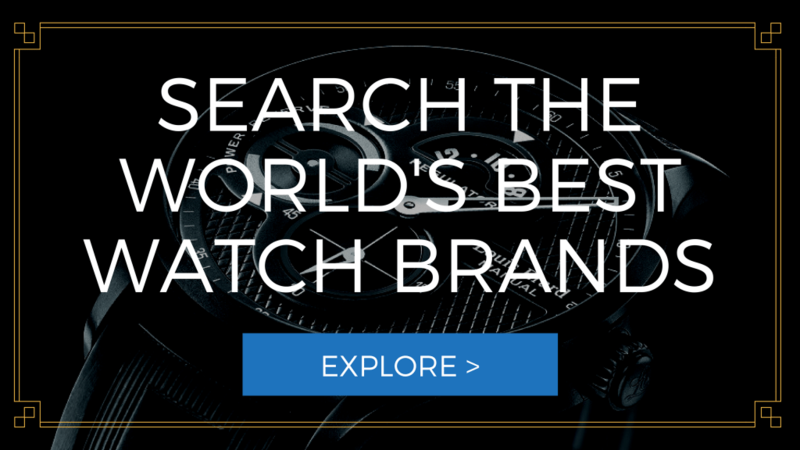 Whether you’re looking to spend under $100 or looking for an investment in a timepiece over $500, our buying guide will set you up with the right Bulova watch for you. Kicking off this list is this Marine Star watch that completes your casual-yet-polished look. Dressed in silver stainless case and contoured segment band, this timepiece emulates the beauty of the classic blue dial with silver-tone hands and hour markers. To offset the elegance of the dial is the rugged appeal of its silver bezel. With its calendar date window and 100-meter water resistance, this watch is more than just what you need to get through day and night events or routines. For the dress watch category, here is a piece you do not want to miss. Featuring the interesting match of a round silver case and black leather strap, this piece will definitely be a favorite go-to for men who want to complete their look with a polished look without looking shiny and glittery. The silver case holds a white dial with silver hour indices and hands. A date counter rests on the three o’clock position of the dial perfecting the minimalist and modern look. Another variation of the minimalist dress watch in the preceding number is this equally clean and modern-looking 96A23-SD. Attached to the black leather strap is the polished and brushed rectangles stainless steel case. The silver-tone dial comes with grid-like design at the center to highlight the beauty of Bulova timekeeping right before your eyes. Spice up any outfit with this two-tone 98H18 watch featuring its glossy silver steel and lavish gold plate. The case holds a white dial embellished with gold-tone hour markers, hands and date window, and enclosed in a gold-tone bezel. The gorgeous dial connects with a heavy duty steel bracelet with gold-tone accents. This watch, with its luminous features on the dial, makes a great piece for evening events. 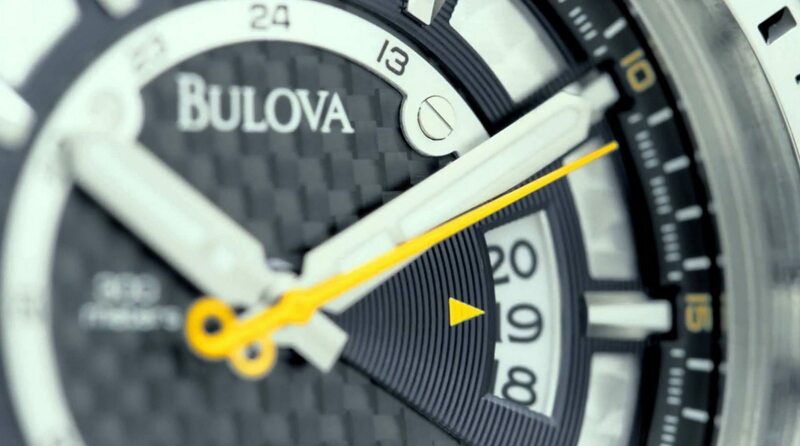 Far from the clean looks of other Bulova watches, here comes this unconventional dress watch. Powered by Japanese quartz movement, this piece features silver-tone brass case and black leather strap with contrast stitching. This piece has an interesting look on it, thanks to its raised pewter hour markers and pewters hands on the pewter dial. It becomes more interesting because of its Frank Lloyd Wright design. To spruce up any outfit, here is a corporate piece that is likewise fashionable and versatile. This watch exhibits the elegance of its silver stainless steel case and the modish black leather strap. The case holds the silver dial with silver-tone hands and hour markers. To preserve the cleanliness and class of the watch, it is protected by a durable mineral crystal. This is yet another minimalist piece to include in your collection. Get the luxury of both silver and gold in this two-tone 98C60. Apart from its reliable 30-meter (99 feet) water resistance, date window, and day counter, this watch looks fancy from dial to the bracelet. The polished gold-tone bezel encloses a champagne dial designed with luminous hour markers and hands, as the case attaches to a brushed steel bracelet with gold inserts as embellishments. When choosing the right watch, performance should be as great as its looks. Here is an impressive watch from the world-class Precisionist collection boasting its continuously sweeping second hand that delivers 16 ticks per second. No doubt, Precisionist watches are dubbed as the most accurate there is. A great piece for all ages, this piece features a dynamic design that you will love. It has a black ion-plated stainless steel case holding the black carbon fiber dial with luminous hands and hour markers. The dial looks cool with the pop of blue color accents on the outer dial and seconds hand. Powered by Japanese quartz movement, this piece is capable of telling not only time, but also date, and is water-resistant up to 300 meters. A ribbed black rubber bracelet completes the bold look. If you have a thing for self-winding movement, then this one might come as a treat to you. The awesomeness of this watch begins with its silver stainless steel case drawing your attention to the black patterned and charcoal grey dial ornamented with silver hour markers and hands. Allowing a view of the inner workings of this watch is a dual aperture dial for the 24-hour and 60-second functions. The movement of this watch can be viewed either through the skeletal subdials or through its clear exhibition caseback. Moreover, it has water resistance up to 99 feet or 30 meters. If you live in what appears to be a totally opposite world of corporate life on weekdays and beach life on the weekend, well this watch is a must-have. This 98B213 incorporates the elegance of the brushed rose gold stainless steel case and bracelet and intricacy of the matte black dial. On the dial rests the luminous hands and hour markers. When it comes to functionality, you can always depend on its Precisionist quartz movement that powers its 1/10-second, 60-minute, and 12-hour subdials. It also has a date window, tachymeter markings, and water resistance subdial. This watch is definitely one of the best! This watch does not only tell time, it speaks of fashion and performance. The silver stainless steel case carries the tasteful and polished black ornamented with white luminous indices and hands. It likewise has a date counter and notched unidirectional bezel. For an executive appeal, the case attaches to an equally tasteful link bracelet. This Marine dress watch is a water-resistant up to 100 meters or 330 feet. Step up and stand out in a dashing piece like 98D109. It features a round stainless steel case topped by a black bezel surrounding the eye-catching black dial embellished with square silver-tone hour markers, which are studded with genuine diamonds. This piece is equipped with two subdials and a date window at the three o’clock position. It makes a great watch for day-to-night events since it has luminous hands for readability. The case is attached to the black bracelet with horizontal silver-tone accents. Majestic! Loving how mechanical watches work? Well, you are in here for a treat as this 97A109 gives you outstanding looks and superb performance. The rose gold-tone stainless steel case comes with a black dial with luminescent rose gold-tone hour markers and hands, minute markers on the outermost dial, and a skeletal display through the movement. It also allows a view of this watch’s inner workings through the skeleton case back. Meanwhile, the brown leather strap tapers elegantly to the case for a more refined look. Another piece from Marine collection is the 98B104. Starting off with its Japanese quartz movement and 100-meter water resistance, this is a totally reliable watch. The rose gold-tone case in handsome angles and edges complements the modish angled black rubber band. As for the case, a rose gold-tone bezel sits atop the black octagonal frame. It encloses a black dial adorned with rose gold-tone Roman numeral hour markers, luminous skeleton hands, date window, and three subdials. Stay minimalist and corporate-looking, while being unconventional with this gorgeous watch. 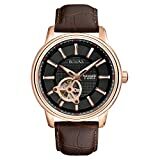 It features a rectangular stainless steel case with rose gold finish, displaying a patterned white dial with luminous hands and hour indicators. It quickly grabs anyone’s attention because of its interesting take on the dial. Apart from the 24-hour and 60-second subdials, it provides a view of the movement in another subdial. The brown leather strap and 30-meter water resistance completes the features of this piece. Revamp your style and go glitzy in this one-of-a-kind 98C005 for men. It incorporates Swarovski crystal with this piece’s sporty design. You’ll be surprised how good it gets. This watch is a stunning piece starting off with its black ion-plated bezel studded with sparkling crystals. This is just an introduction of the beautiful silver patterned dial designed with day, date, and 24-hour subdials. The luxurious feel continues to the crystal-studded two-tone bracelet. This piece looks sharp, modern, and distinct. Another piece for men, who love it simple but still nailing the edgy, smart and masculine look, is this Accutron watch. The round rose gold plated case looks extra fancy with its rose gold-tone accents on the black patterned dial. It is fixed with a day and date window, 30-minute, 60-second, and 12-hour subdials. Of course, matching the elegant case is the sophisticated brown leather strap with buckle for closure. This is the lightest way to go dashing in an instant. 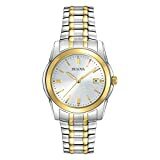 Getting a superior quality watch from a top notch name like Bulova will not require you to go and break a bank. Experience the legacy of excellence in this Precisionist watch you will love. This piece is constructed with silver stainless steel for the case and bracelet, both dressed in silver. The dial is intricately designed with a tachymeter on the outermost dial, luminous hour markers and hands, 12-hour, 60-minute, 1/10-second, and water resistance subdials. 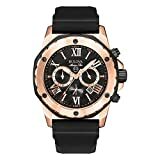 But what makes this watch among the best from Bulova is it is powered by the accurate Precisionist movement and its pop of colors suitable for its 300-meter water resistance. This next piece makes a great addition for any man’s wardrobe. The all rose gold plated case and bracelet emanates beauty and luxury. It features a brown dial adorned with luminous rose gold-tone hour markers and hands as well as date counter and triple subdials. This is an ideal piece for day-to-night engagements. 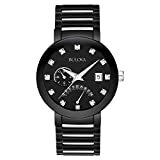 Reward yourself with this bold watch from Bulova. This piece speaks of style and functionality. The rugged look of stainless steel case exudes masculinity, which is embodied by the black dial with luminous hour markers and hands. It has a date window and a unidirectional bezel. Whether it is on land or under the water, you can always depend on this watch. It is equipped with a frequency of 262 kHz for accuracy as well as 1000-meter water resistance for underwater use and operations. The case is finished with a black silicone strap that is lightweight and fashionable. Just as we started this list with an outstanding piece, we are completing the same with an equally spectacular watch that is 64B108. If you are a sucker for dress watch, then you will surely love this self-winding piece. The rose gold plated case displays a black patterned dial embellished with rose gold-tone hour markers and hands as well as date indicator on the three o’clock position. The case is fixed opposite to a black silicone strap. It is a water-resistant up to 300 meters.